Even if you’ve never been to Skellig Michael, you can picture it: A giant beak of stone rising from the sea and pointing at the sky. You’ve heard about its monastic settlement, its rich birdlife, and its fascination for Star Wars: The Force Awakens director J.J. Abrams, but if you are afraid of heights, all you can think about is that giant beak of stone pointing 218 metres up in the air. 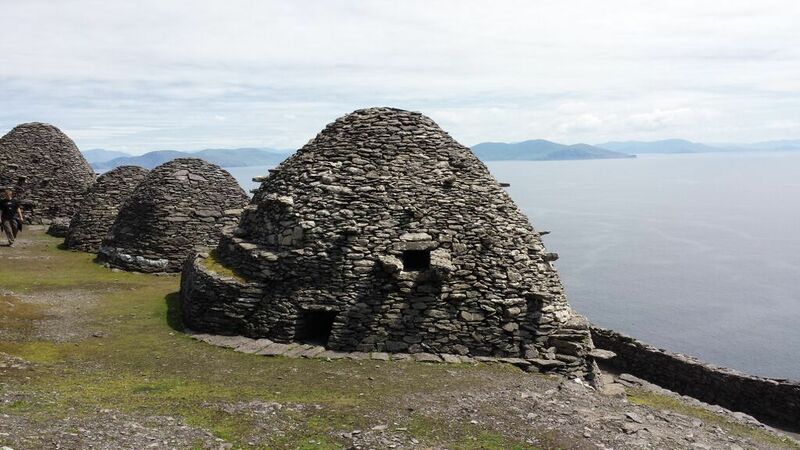 You wonder how anybody could trot up the sheer face of Skellig Michael to the top, let alone build a hermitage there, and you vow that the closest you will ever get to it is on a nice little boat trip around its base. Then a friend of you invites you to go with them, a relative promises Xanax, and the sun settles into a warm glowing purr over the western Atlantic. Some people call it vertigo, the correct medical term is acrophobia, and my version of it is sheer sweaty terror at anything higher than a bar stool, but it’s easy to forget on the boat out to Skellig Michael. The sky overhead is a scorched blue even at 10am, and the sea is a sparkling of white-tipped wavelets. Gannets and fulmars start to appear, wheeling and screeching overhead as we approach the Little Skellig, a mighty chunk of crag-crusted rock that retains its majesty despite a layer of guano that must add several feet to its height. By the time we swing around the base of Skellig Michael, I’m in ridiculously high spirits (I turned down the offer of Xanax, by the way) and have forgotten the entire object of this trip. Then, as the boat bobs and lurches to a stop at the ancient little pier, I have time to look up, a long way up, toward the top of what is effectively a tower of rock. And, like towers everywhere, this one is fairly lacking in nice, covered walkways. In fact, if it wasn’t apparent already, the helpful guide reveals that the only way to the monastic settlement above is via a series of teetering stone steps. Steps from which, he cheerfully informs us, two visitors have fallen to their deaths within the previous 12 months. 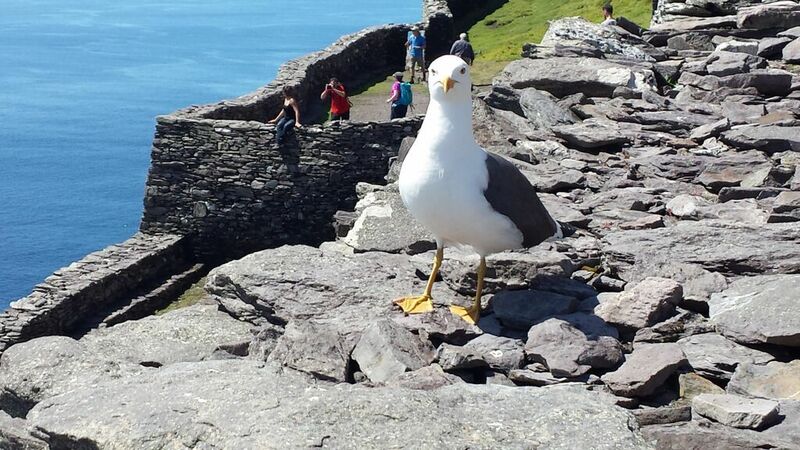 It strikes me then that it is really quite pleasant here at the base of Skellig Michael, and that I would be quite happy staying right where I am, soaking up the sunshine, looking out at the white peak of Little Skellig and listening to the birds until the boat leaves again. Really, I’m grand. But “grand” won’t cut it. Not when it is probably the most perfect day of the year (or any year) to see Skellig Michael in all its mystical, monastic glory. So, we climb the steps, me on the inside, interspersing my silent prayers with gibbering “I can’t! No, I can’t” and variations thereof. At various points, I am most ashamed to admit, I have to be dragged along by my belt. These are not my finest moments. But then the climbing stops and we reach Christ’s Saddle, the relatively flat and open area at the base of the pinnacle where a particularly unsocial monk chose to build his hermitage. I see one of the other people from the boat minus her companions. She is sitting alone on the grass, smiling vacantly in the direction of our ultimate destination and looking rather dazed. I get a bad feeling. “I took a look and decided against it,” she reveals. I don’t understand. The beehive huts are just feet away. But then I take a look, and I see why our travelling companion has stalled. The last few feet of the path hug the side of the rock, and the other side—well, the other side is just air. The end of the journey is something like childbirth: It’s all a bit of a blur, but when it’ finished, the result is pure euphoria. Right there, surrounded by the monks’ incredible creations, with painted puffins fluttering in and out, and the sun painting sea and rock in a glorious welter of heat and light, it is pure heaven. And I plan on visiting heaven only once.